RentMichiganCabins.com is celebrating our fourth year online, and for the fourth consecutive year we are proud to sponsor Fishing Has No Boundaries, a great 501-C3. Community support: Fishing Has No Boundaries. 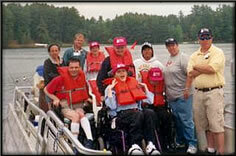 RentMichiganCabins.com is a proud sponsor of Fishing Has No Boundaries. They are rooted in Wisconsin, but have now expanded their cause to 11+ states, including Michigan. FHNB are a non-profit 501-C3 organization whose goal is to open up the great outdoors for people with disabilities through the world of fishing. "We believe through education, training, and the use of adaptive angling equipment, everyone is able to share in a dream come true." We encourage you to check out their website and consider making a contribution yourself. Featured in BizWire. JM Creative Group rolls out 6 state-specific, book direct vacation rental websites and tops 3 million page views. Plans for a minimum of 21 state websites. Wisconsin State Journal/Business: Featured Article. Sites that connect cabins with customers continues to grow. Looking to compare vacation rentals outside of Michigan? RentMinnesotaCabins.com Including Brainerd, Alexandria and Minnesota Lakes rentals. RentWisconsinCabins.com Nearly 700 Wisconsin vacation rentals on one website. RentNewYorkCabins.com Compare vacation rentals in Lake George, Finger Lakes, Adirondacks, Upstate and more. RentMontanaCabins.com Plan and book directly with Montana rental owners or managers. RentTennesseeCabins.com Book directly with Tennessee cabin owners and get the lowest price online.